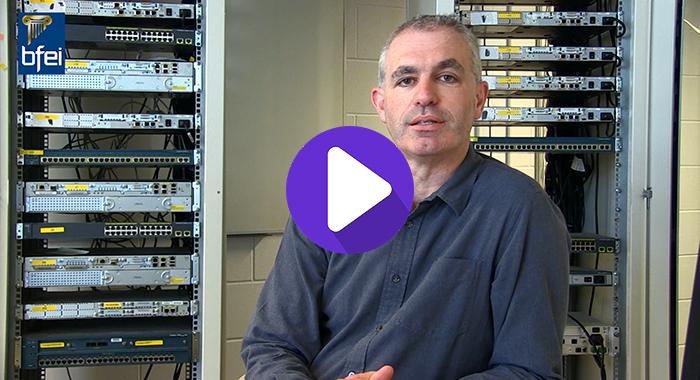 Are you looking for an alternative pathway to a degree in Networking Technologies? The Pre University Networking Technologies course in BFEI will teach you how to build and configure computer networks, you will also acquire the skills to identify security threats and deploy appropriate mitigation strategies. Computer Systems Hardware. Understand, build and maintain computer systems. Operating Systems. Install, configure, utilise and maintain computer operating systems. Networking Essentials. Support the operation of typical computer networks. Implement and maintain common network configurations. Distributed Sytems. Learn the fundamentals of distributed systemts and how they can be deployed. Virtualisation. Participate in the implementation and maintenance of a virtualised computers and networks. Maths. Apply a range of mathematical skills and tools related to working with computer systems and networks. Communications. Acquire the competence to communicate verbally and non-verbally in standard everyday tasks and in work-related tasks. Work Experience. Participate in a workplace for a minimum of two weeks, carrying out work-related tasks independently and while under general direction. Cyber Security Essentails. Develop an understanding of cybercrime, security principles, technologies, and procedures used to defend networks. Certified by Cisco. This course is certified by QQI and Cisco. QQI assessment is based on a combination of project work submitted during the year and exams. On successful completion of this course, learners will be awarded a QQI Level 5 Certificate in Computer Systems and Networks (5M0536) and CISCO Cyber Security Esssentials. Further details on the Cyber Security Essentials certification are available from https://www.netacad.com/courses/security/cybersecurity-essentials. Entry to degree programmes is based competitive assessment of results.